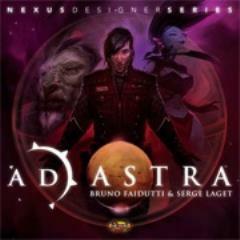 Ad Astra takes three to five players into a possible future where five disparate human subraces must explore the galaxy and search for new habitable planets. Players will discover resource-rich planets and mine them to build space ships, colonies, and factories. Players can also find ancient alien technologies that can swing the balance of power in the universe. This interactive, science fiction-themed Eurogame features a modular game layout, high-quality plastic playing pieces, cards, and counters, and a strategic action-programming system where players must plot their moves in advance as well as try to predict the actions of their opponents.